List your property with Hawai‘i Life. A statewide network of agents and 13 Hawaii office locations. International affiliations with Christie’s and the Luxury Portfolio. Syndication to Zillow and other leading websites. In-house design and marketing services. 22 million viewers on HGTV. Massive website traffic of over 260,000 monthly visitors on HawaiiLife.com. Private database of over 126,000 registered users. Outreach through social media, PR and direct marketing. 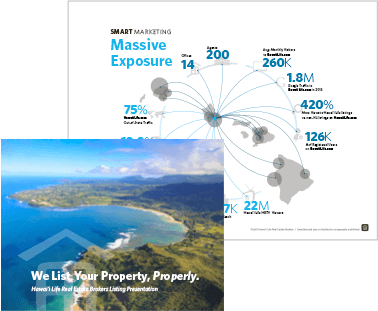 These are just some of the things that make Hawai‘i Life a powerful, effective way to sell your home. Homebuyers need representation. Our expert, local agents look out for your interests and listen to your specific objectives, needs and style. A dedicated Hawai‘i Life buyer’s agent ensures that you get the right home, for the best value. Put Hawai‘i Life’s design and marketing systems to work for your special project. We can assist with branding, budgets, collateral and marketing. Hawai‘i Life agents can provide on-site sales teams. We’re here to represent. Get a Free Home Evaluation.